Adjust amount of ingredients depending on number of people you are cooking for. There were only 2 of us, so I used one leek, about ¼ of a 300g packet of spinach, and a handful of peas. About 1 tablespoon each of flour, dijon and horseradish paste/sauce. Plus around 1-½ cups of breadcrumbs and about ¼ cup of parmesan. If your spinach is not pre-washed then quickly wash and shake dry. Heat a few tablespoons of water in a pan and add spinach. Cook until wilted and take off heat. Place in a colander/sieve so the water drains. Meanwhile add about 1 tablespoon of butter to the pan and add the leek. Cook for about 6 or 7 minutes. Add flour and stock with the dijon/horseradish mix. Keep mixing until this has thickened. Add the drained spinach and frozen peas and mix well. Add salt/pepper to taste. Put this mixture into a baking dish. Mix parmesan into the breadcrumbs. My breadcrumbs came from some bread I had make the night before, and as it was a herb bread it didn’t need any seasoning. But you could add some fresh or dried herbs to your crumbs if you wish. Sprinkle breadcrumbs over the vegetable mixture. Add a few little dabs of butter here and there – this will help the breadcrumbs brown. Cook in a 200 degree Celsius oven for around 20 minutes. Towards end of cooking if breadcrumbs haven’t browned, then pop under the grill for a short time. As a first step you can put some butter into a pan and cook the breadcrumbs until they are toasted. You could use milk or cream instead of the stock for a richer sauce. Use whatever mix of vegetables that rock you. It went really well with the fish – my only regret is that we didn’t have scrumptious fresh fish – but in the middle of winter with a week of bad weather – it’s not that easy to find fresh in our little town. The day didn’t get any warmer and thinking about dinner I decided we had to have something hearty and yummy. I had some chicken thighs in the fridge (quelle surprise! – no not at all – we always have chicken thighs) and had to pop down to the village for a few other ingredients. The walk was refreshing and by the time I returned Mr MWCED had lit the fire and was kicking back with a red wine. I know I should have made the pastry, but bought is just so easy……. Heat oil in frying pan over medium-high heat. Cook chicken for 3 minutes each side or until almost cooked through. Transfer to a plate. Season. Cool and cut into 2cm pieces. 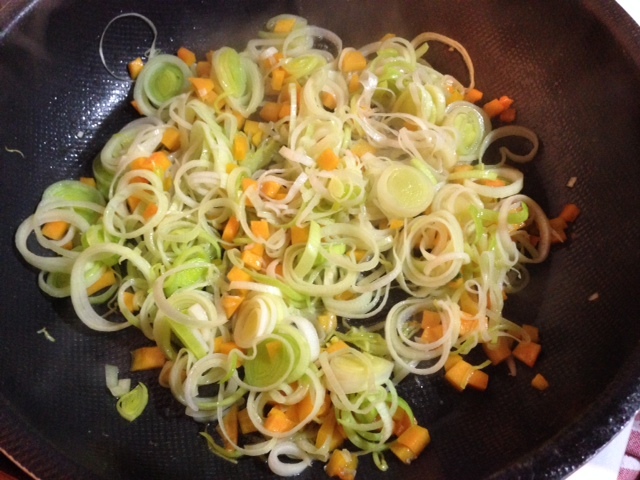 Add leek and pumpkin to pan. Stir for 5 minutes or until soft. Add garlic (add mushroom now if you are using instead of pumpkin). Stir in chicken, cream, mustard, thyme and parsley. Add salt & pepper – as much as works for you. Cook for 5 minutes or until chicken is cooked and sauce has thickened slightly. Take off heat and cool. Stir in cheese. Preheat oven to 220C. 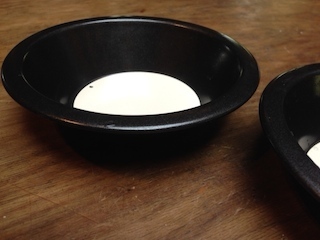 I used four 12cm pie dishes, these don’t require oiling, but yours might. Cut four discs from the shortcrust pastry and line pans. Prick bases with a fork. Bake for 10 minutes or until light golden. (The original recipe suggested removing pastry cases and placing on a lined baking tray – however I left them as is, and fully baked in the pie tins). 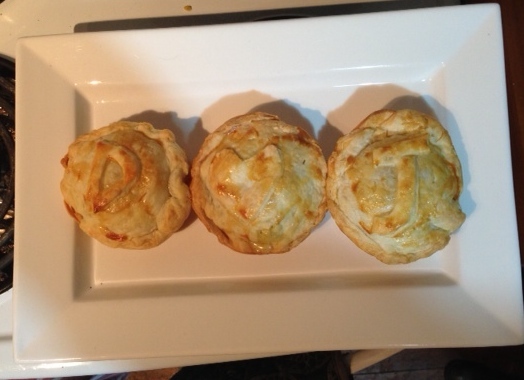 Divide chicken mixture among pastry cases. Now cut four rounds from the puff pastry. (haha, I think someone put some shortcrust back into the puff pastry bag, as it sure didn’t rise like it should have – worked fine though!) Brush the edges with the egg. Place over the chicken mixture, pressing edges to seal. Cut whatever your artistic fancy demands to decorate the top of the pastry. Brush with egg and place on top. Cut a small slit in the top of the pieces. Bake for 10 minutes or until puffed and golden. Let cool a few minutes and then take out of pans – lucky me my pans have a removable base. Obviously this step is redundant if you decided to cook the pies out of the pan when you were at the stage of adding the filling and puff pastry tops. We ate two pies for dinner and froze two. That will make a quick dinner one night during the week when the magic fridge doesn’t cut it. Definitely tasty and got the thumbs up from Mr MWCED.